Tyga has announced that he needs a girlfriend after splitting from on and off girlfriend, Kylie Jenner. 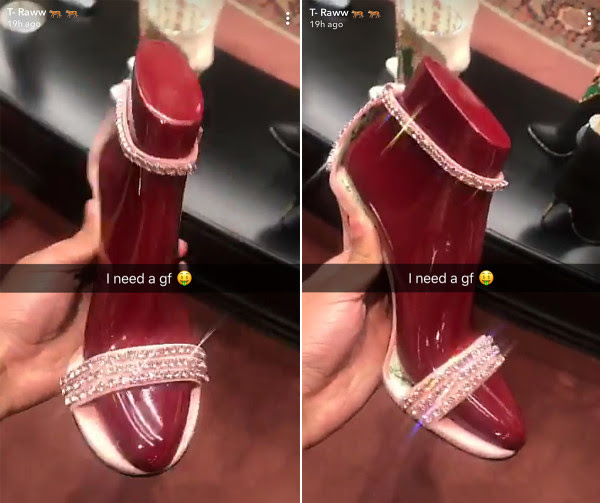 “I need a gf,” the 28-year-old rapper captioned a Snapchat picture of himself admiring a diamond-studded pair of high heels. Jenner has since moved on with Travis Scott and is reportedly pregnant with the couple’s first child together. The confession comes over eight months after his high-profile separation from Kylie Jenner. The couple dated on and off for over two years before officially calling it quits this year.